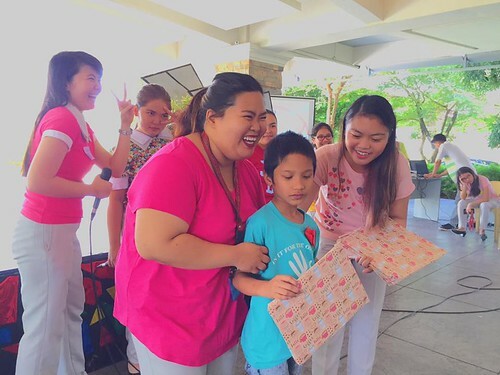 It was a fair day on the 26 September 2016 when the psychology students of Lyceum of the Philippines University - Cavite Campus (LPU-Cavite) held their annual immersion with SPED students particularly children diagnosed with autism spectrum disorder. The immersion had a theme called, “Kaleidoscope: Appreciating the Different Colors of Autism”. The psychology majors felt the event went beyond academic requirement but valued the personal engagement with exceptional children. Despite the sensory and processing challenges the children experienced, the students realized how fun it was to interact with the children and how it made a difference to them. Mr. Clarence G. Manicad of the College of Arts and Sciences, shared his insights and remarks as an opening. He mentioned that love was the reason behind the gathering. It proved that there are still kindhearted people who will care for these special angels in a manner they deserve. With the help of the guardians who showed their undivided attention and affection, this immersion opened a new door of understanding for the psychology students. The multi-faceted program provided opportunities to interact with the children with autism, play with them, and learn from the children’s guardians. Ms. Jan Peña, the president of the Autism Society Philippines Dasmariñas Chapter, delivered her message about how grateful she was to have this kind of event wherein children with autism are being given the chance to be themselves apart from when they are at home or in their schools. She wishes that this immersion will not be the end and that more promising endeavors like this will continue. About the contributor: Camille Audrene P. Gamayon is currently taking up Bachelor of Science in Psychology in Lyceum of the Philippines University, General Trias, Cavite. She is the project manager of their organization called the League of United Psychology Students and a member of the LPU Scholastic Society and the LPU Peer Facilitators Group. Ms. Gamayon is also a contributor of their university paper called the Laurel Leaf.